Best Western Center Inn has an ideal location in the heart of Virginia Beach, with close proximity to Norfolk International Airport, Norfolk Naval Base and Norfolk State University. Located just off of Interstate 64, Best Western Center Inn is an excellent base for those travelling to Virginia Beach on business, whilst tourists will find themselves effortlessly close to the area’s beautiful beaches and the vibrant array of shopping, dining and entertainment amenities of Norfolk, Virginia Beach, and beautiful Chesapeake Bay. Best Western Center Inn hosts 50 well-appointed guest rooms over two floors, offering clean, comfortable rooms which come equipped with private bathrooms, cable TV, a refrigerator, and a coffee maker. A complimentary breakfast buffet is available to all guests, whilst the range of amenities on offer in the hotel include a refreshing outdoor swimming pool. A business center, and free WiFi in all rooms and common areas. Guests of Best Western Center Inn benefit from a contingent of professional and conscientious staff, including concierge services, a 24-hour front desk attendant, and daily housekeeping. 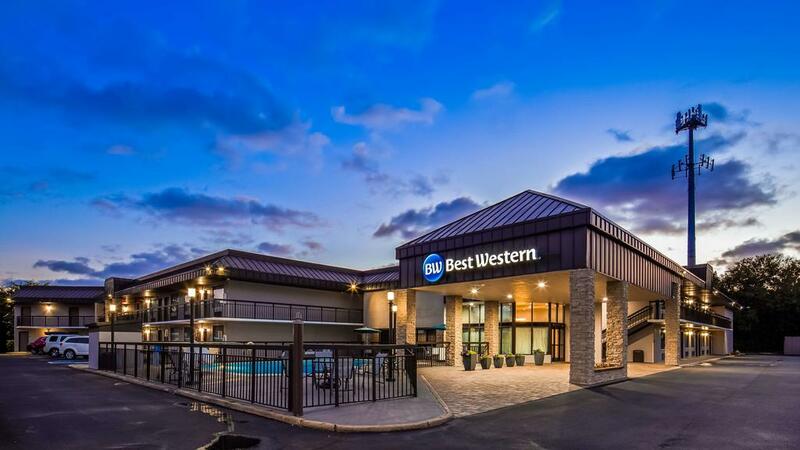 Best Western Center Inn represents a high standard in quality at an affordable rate, giving guest exceptional service, premium amenities, and an unbeatable location. Below is a map to Best Western Center. For door to door directions, please click “Directions To”. Zoom in to see more details.